Today we are going to have fun today doing art! 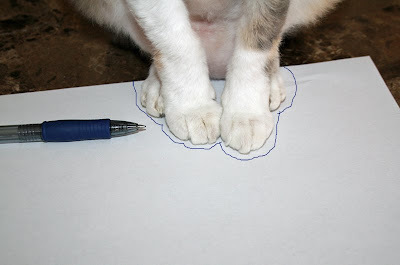 It is a special art form I invented called Paw Doodles. All you need is a pen and paper. First ask your mom and dad if you are allowed to play with pens. Here is my first Paw Doodle. Just trace all around as many paws as you want. I am doing all four paws at once! But only because I have had lots of practice. You might want to start out with an easier one. And look what I made from my outline! 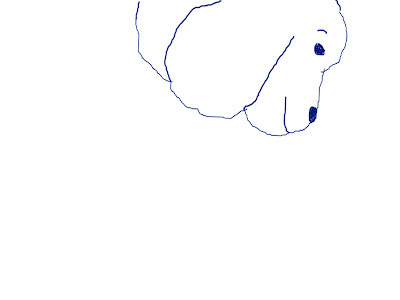 It is a drawing of a cute little dog. It looks like something might be a little bit wrong with his neck. Or he has a real skinny leash. Harley wants to try a Paw Doodle! He has trouble holding the pen. That is because he is still a kitten. Here is Harley's first Paw Doodle. He is outlining his whole arm! And he made it into a snake! I am pretty sure this is a diamond back. Stay away from them. Harley wants to try again. I think he is going for an easier shape this time. 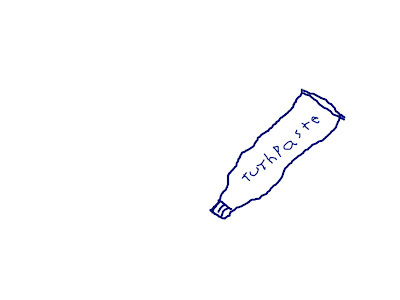 He made a tube of toothpaste! Hahahaha! He might need some spelling lessons. We loooove your paw doodles! You are both such talents! Squee, squee, squee!!! You are both so artistic! oh oh oh we has to try that!!! what a wonderful cats you are! I'm impressed! you have so much talent! artists indeed, both of you! so cute! your mommy and daddy must be very proud! These are very funny. Maybe the dog in the drawing just has lots of jowls? Those are excellent paw doodles; Harley is catching on but maybe next time you can help him spell. We will have to try the paw doodles too! Those are good paw doodles. Harley is learning fast. You are a good teacher Daisy. Paw doodles look like fun. We want to try it. We have to be careful with pens because once Sniffie carried one into the kitchen and the woofies ate part of it!! Daisy and Harley, you are such creative, clever kitties! What fun drawings. Will your Mommie put them on the fridge? These are two kitties after my own heart, not only are they artistic, but they draw doggy paw doodles, gotta love them felines. 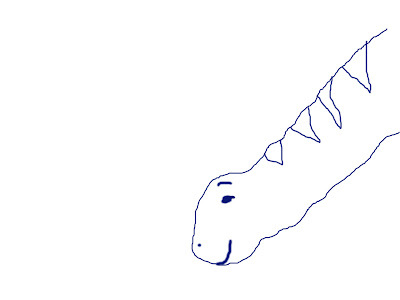 you are both so advanced artists. I have never used a pen. Wow Daisy and Harley you guys did some pawsome doodles there. I think you guys did a wonderful job on your art work today, very nice. Have a wonderfur day today. That was fun! And that snake is smiling! What's he smiling for??? The two of you are so talented. I just love your paw doodles. I hope you are staying warm down in sunny Florida. Daisy...I love you, I miss my friend a cat named Keecha and you bring joy into my life the way keecha did at one time. WOW!!!!!!!! Daisy,you and Harley are so artistic!! You have a wonderful, lively imagination too!!!!!! You are so talented...if I get a pen a paper, I bat the pen around and then rip up the paper with my teeth! So mom says I'm not yet allowed to doodle! I'll just have to admire yours. That looks like fun! We're going to try some paw doodles when I get home tonight! How cute! You are so creative, Daisy! My mommy hasn't been letting me visit. I really need to catch up on what you and Harley have been up to. 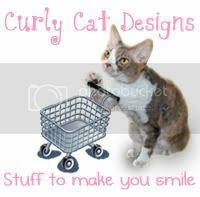 Wow maybe I should put in an order for an orignial Harley or Daisy before you become too famous!! Meanwhile Tandy is eating a roll of Viva towels- My cats are not as artistic as you 2!! Such funny doodles! I'm gonna make Mommy try it wif me now! That is so cool, Daisy! I am going to have to try that! You have both done very good jobs in your drawings. i'm gonna have to see if the boyz wanna paw doodle. since they are beginners i expect them to be more on the harley level than the daisy level. You two are really creative. I love to chew pens, so I might have hard time convincing Mom... It's the only thing I destroy..
You cats are so talented. My cats just like to bat the pen off the table and chase after it! Your pictures turned out very nice! It's very cute how Harley likes to learn things from you, Daisy! What a great art project, Daisy! We're pretty crafty around here, so we'll be sure to give that a try! We are going to try that, Daisy. Wonder which one of us will 'volunteer' probably not Malachi. You guys are having so much fun! I think I'm getting the Giant Kitty to helps me tries this doodle thing too. Great doodles!! You are both so very creative! 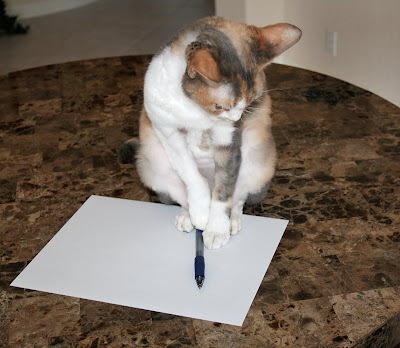 Maybe one of those Jumbo pens would be easier for Harley to draw with? Our mom's niece uses one in kindergarten. very cool daisy!!! i tried it and my hand looked like a turkey! i am so excited! Wow Daisy! You constantly surprise me with all your hidden talents! Daisy, you are so clever! That is very clever. You are so talented Daisy, and Harley has done quite good too! This was so cute it made us teary-eyed! You are purrrfect, Daisy! How else wood yoo spell tuthpaste? You are all so darn creative at your house! We're jealous! Those are all very cute pawdoodles!!!!! Meowm thought Harleys' second one looked like a bottle of Coke. 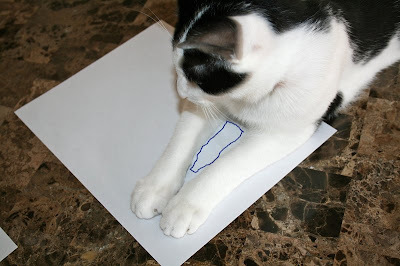 We think that you have developed a new "ism" (Paw Doodle-ism). Hey! I think that doggie looks like me!!! Wow ... Great artwork!!! We are gonna do that too. you iz like that PiCattso guy!!! very talented! you should open a schools and teaches other kitties how to doos arts! Those are awesome! That puppy is super cute. Mama needed the smile today. Thank you! hey Daisy those are pretty cool. I bet you could do some great paintings. 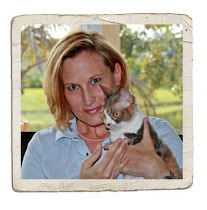 Have you ever read the book Why Cats Paint? there are some great paintings by cats... and have you seen the paintings by Kamala the elephant? She did them right here...in our zoo... they sell for a pretty good price. Wow! You guys are great artists! How about that? 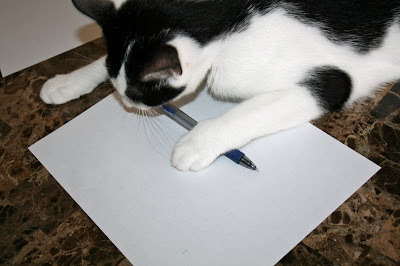 We like your paw doodles, and we will have to have our human try that with us, too. This is definately a good pastime for rainy days. I know miewmie has lots of pens and papers cos she uses them to pwactice writing her chinese characters. Daisy, That looks like FUNFUNFUN! Oh boy, dat looks like a really fun past time! Yoo are being such a good big sisfur Daisy! Harley is lucky to haf yoo. wow! you are both so talented. I'm not sure mommy would let me play with pens tho, Bendrix might get out of hand. Harley, you are a natural! With a little more practice, you'll be as good as Daisy. Perhaps she will teach you watercolors sometime. 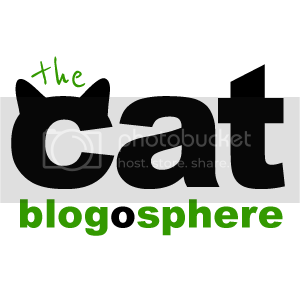 Your blog makes me smile everyday! Thank you. Dem lookz finez, Daisy! U iz so talenteded! OK? That looks like fun. May be when Mom is home more we can try too! Wow that is a lot of fun! I will have to try it but I think I will probably try to eat the pen. Daisy that is such a neat idea, we want to try that when our bean is home from work to help us. we usually try to eat pens but perhaps we can learn to have fun with them like you did! ps. did you know today is "national answer your cat's questions day?" you should ask your mommie some important questions! WOW! Great paw doodles! We have to try that! Now those are furry clever, are yoo going to put them up fer auction? Yoo cud get green papers fer them fer sure! spellin lessonz? did u say harley needz sum spellin lessonz? Those are very good Paw Doodles. I'll have to try one later! You are both so talented. That was a lot of fun, Daisy. The trouble for me, though, is that I like to eat the pens and pencils. I love your paw doodles. we need to try that. It looks super fun!! I love Harley's invisable flute too (yesterday's bloggie, we missed it, ooops). he should take lessons, he is a natural!!!! My goodness Daisy! I had no idea you were so creative and I love your artwork! Daisy, I hate to brake it to yoo, but I think that IS the way yoo spell tuthpaste. Paw doodles game is great! I am going to try it and will tell you the result! Paw doodles look like fun! You two are very creative. Daisy, that is very nice of you to coach little Harley since you are such a talented artist. I think you're both pretty talented..and who'da thunk of doin' Paw Doodles? Only you, Miss Daisy! Those wuz some good drawings! I thought the last pitcher looked like a bottle but then when Harley made the toothspaste I thinked it wuz much better that way. Wow Daisy and Harley, that looks like soooooo much fun! You two did great with your works of art, we couldn't even come close! Hay Daisy and Harley, I misst yoo so much! I'm glad yoo guys are doin so good. Yoo is so lucky to have the Hepper Pod! Yoo are one lucky spoiled girl. (and boy) I kant wate to heer all about yur space advenchures. Pawdoodles are pawsome! We will have to try this sometime! You two never cease to amaze me with your talent! Wonderful doodles! Well will the wonders of you two never cease. What a great idea, Daisy. That is an amazing art project..
How adorable you two are. Hi Daisy. I could do with you over here helping me to finish my book, though I do not think you would like the weather as it is cold and wet and the earth is full of water. All cats here need cat wellies! When I have finished working on this book, which is supposed to be next week then I will get the cats here to do some paw doodles. Meanwhile love to you all. HAve to go, Rosie is eating my slippers. Very good! You are both very talented. hey daisy. 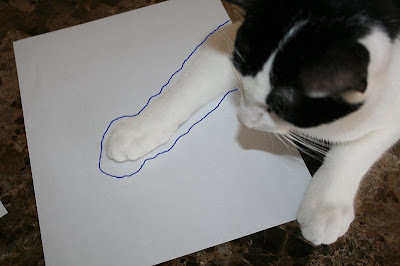 you are a really creative cat..
We love your Paw Doodles Daisy!! You are very talented! And Harley did a great job for his first time,too! Wow, how artistic of you both!!!! What a great idea! wow! you look really pretty in pink, and that accessory makes the outfir glamorous. you're such a good model, Daisy. You certainly do get lots of pretty things Daisy! The crown looks lovely on you. You are really genius.. so creative too. Love the paw doodles...that is such a fun idea I will have to see if my mommy will help me do that.